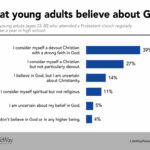 NASHVILLE, Tenn. — Most young adults who attended church as a teenager say they believe in God today, but fewer consider themselves devout Christians. And as a whole, they have conflicting recollections about the churches they attended in high school. 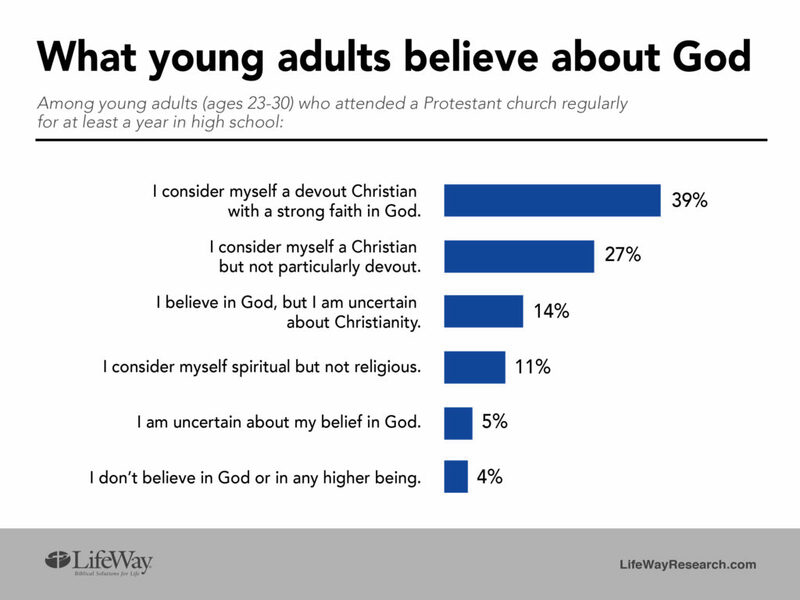 LifeWay Research surveyed more than 2,000 American adults between the ages of 23 and 30 who attended a Protestant church twice a month or more for at least a year as a teenager. Today, 39 percent say they consider themselves a devout Christian with a strong faith in God. Fewer consider themselves Christian, but not particularly devout (27 percent). Even fewer say they believe in God but are uncertain of Christianity (14 percent) or say they consider themselves spiritual, but not religious (11 percent). Only a small number say they are uncertain about their belief in God (5 percent) or say they don’t believe in God or in any higher being (4 percent). Two-thirds (66 percent) of those who attended church regularly in high school dropped out for at least one year as a young adult. “During the years most young adults are gone from church, they tend to hang onto their faith but don’t make it a priority,” said Scott McConnell, executive director of LifeWay Research. Researchers found significantly different spiritual perspectives between those who dropped out of church and those who stayed. Those who dropped out of church as young adults are less likely to say they consider themselves a devout Christian today compared to those who stayed in church (29 to 60 percent). Those who stopped attending church for at least a year are more likely to say they believe in God, but are uncertain about Christianity (17 to 8 percent); say they consider themselves spiritual, but not religious (13 to 5 percent); say they’re uncertain about their belief in God (7 to 3 percent); and say they don’t believe in God (6 to 1 percent). Among all young adults who attended a Protestant church as a teenager, 61 percent say they currently spend regular time in prayer privately. Half (49 percent) want the church to help guide their decisions in everyday life. Fewer say they consistently give financially to the church (37 percent), spend regular time reading the Bible privately (36 percent) or attend a church small group (32 percent). Those who didn’t drop out of church are more likely to say they do each of these. When the young adults think about the years immediately after high school, those who stayed in church felt welcomed, connected and mostly agreed with what they heard at their church. Those who dropped out of church had vastly different perceptions of the congregations they left behind. When asked to share the opinions they had as an 18- to 22-year-old about the church they attended in high school, half (52 percent) say they agreed with the beliefs their church taught. Similar numbers (49 percent) say their church genuinely demonstrated how to follow Jesus. Perceptions were significantly different, however, between those who remained in church during that time and those who dropped out. Three-quarters of those who stayed (75 percent) say they agreed with the beliefs of their church, while 40 percent of those who left say the same. Seventy-two percent of those who continued to attend felt their church modeled how to follow Jesus. That dropped to 37 percent of those who left. I felt connected to the church as a whole (61 percent of those who stayed, 24 percent of those who left). I agreed with my church’s political perspective (63 percent, 29 percent). The pastor’s sermons were relevant to my life (67 percent, 33 percent). 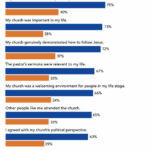 My church was important in my life (73 percent, 28 percent). Other people like me attended the church (65 percent, 33 percent). When asked specifically about impressions of church members, young adults found some good traits. Overall, 46 percent say church members were generally welcoming. More than 4 in 10 say church members were authentic and caring (42 percent each). Slightly fewer say those at their church were forgiving (37 percent) and inspirational (27 percent). Young adults also remembered negative characteristics about church members. Forty-one percent say they were judgmental; 37 percent felt church members were cliquish; 36 percent said people in the church were disapproving of those who didn’t meet their expectations; 34 percent thought church members were hypocritical; and 31 percent said members were insincere. Those who stayed in church are more likely to agree with each of the positive attributes and those who dropped out are more likely to agree with the negative traits. Young adults are more than 3.5 times more likely to say church members were politically conservative (46 percent) than politically liberal (13 percent). For more information on the study, visit LifeWayRearch.com or view the complete report. The survey was conducted Sept. 15 – Oct. 13, 2017. Slight weights were used to balance gender, ethnicity, education and region. The sample was screened to only include those who attended a Protestant church regularly (twice a month or more) for at least a year in high school. The completed sample is 2,002 surveys.